"This is an excellent peanut butter pie recipe. My grandmother requested it many years ago from a restaurant that served it. 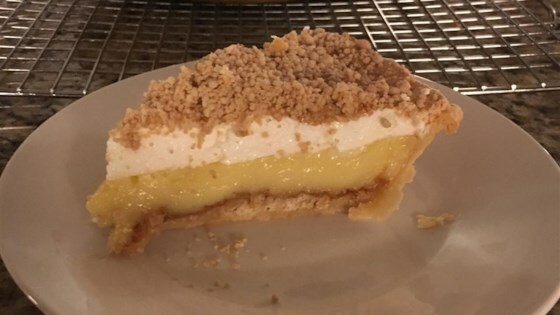 Everyone who has had this pie loves it." Mix confectioners' sugar and peanut butter until mixture has a crumbly texture. Sprinkle half over the bottom of the shell. In the top of a double boiler, combine milk, 2/3 cup sugar, salt, vanilla, cornstarch, and egg yolks. Cook over medium-low heat until thick. Pour filling into crust. Beat egg whites until foamy. Add cream of tartar, and continue beating. Gradually add 6 tablespoons sugar, and continue beating until stiff peaks form. Spread over the top of the pie. Sprinkle with remaining peanut butter mixture. I use whole eggs in the custard and do NOT top with the meringue. Everyone requests that I bring this to all pot-lucks! This recipe is the REAL deal, the best peanut butter pie I have ever made! I didn't change a thing in the recipe, it was perfect. I've been making this recipe for years, and it's excellent. I also use this basic recipe, along with some homemade peanut butter cookies and whipped Cream, to make a killer trifle!